This is Regressing, a numbers-minded column by our clever friends at the Harvard Sports Analysis Collective. Today: Connecting Blake Griffin and Charlie Parsley in eight easy steps. You all know the Six Degrees of Kevin Bacon game. Some of you may even be familiar with the Erdős number, which uses authorship of math papers to measure the "collaborative distance" between a person and the mathematician Paul Erdős. I applied this same type of thinking to sports and went looking for the Center of the NBA Universe. What I found, in the end, was Buddha and Moses. Before we get to that, let me explain what I did. For my analysis, I included every player in the 62-year history of the NBA, as well as anyone who played on those BAA and ABA franchises that were eventually incorporated into the NBA. From there, I went about determining the shortest average links between players, using teammates as connections. It wasn't easy. 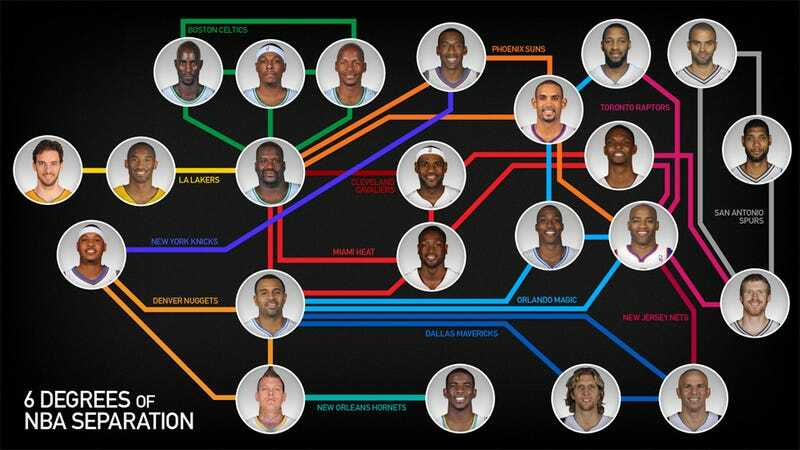 I had to find the shortest way to link all 12.5 million pairs of NBA players. Assuming each pair can always be linked in six degrees, there are 6.81x10^17 possible ways to do so for each pair. However, I was able to spare my computer some computation. After forming a giant graph of the entire NBA, with nodes representing players and edges representing teams, I ran a shortest-path algorithm on the entire system. It's the same sort of algorithm that Google Maps would use to determine your shortest route. The specific algorithm I used, Dijkstra's algorithm, was published the same year that Wilt Chamberlain was drafted into the league. The rule of thumb is that you don't need more than six connections to link any two people. Not so the NBA, at least if you include its entire history. It turns out that the maximum number of degrees of separation needed to connect any two players who have ever played in the league is eight. For example, to link current Los Angeles Clipper Blake Griffin to Charlie Parsley of the 1949-1950 Philadelphia Warriors, you need eight connections: Blake Griffin, who played for this year's Clippers with Baron Davis, who played for 1999-2000 Hornets with Dale Ellis, who played for the 1990-91 Bucks with Adrian Dantley, who played with the 1976-77 Buffalo Braves with Fred Foster, who played on the 1969-70 Cincinnati Royals with Bob Cousy, who played on the 1950-51 Celtics with Kenny Sailors, who played on the 1947-48 Philadelphia Warriors with Chink Crossin, who played on the 1949-50 Warriors with – deep breath — Charlie Parsley. Obviously, it takes several steps to connect modern players to those from remote eras. But if only current NBA players are considered, the maximum number to link all players is four. Byron Mullens to Xavier Henry, for example: Byron Mullens played for last year's Thunder with Etan Thomas, who played for this year's Hawks with Al Horford, who played for the 2007-8 Hawks with Acie Law, who plays for this year's Grizzlies with Xavier Henry. While four and eight are the maximum, if any two players were chosen at random the expected number of degrees separating them would be only 3.37. To the left is a chart that shows the distribution of number of degrees separating any two players. We can determine the player with the widest average separation between him and his colleagues. Let's call him the Outcast of the NBA Universe. Many Grizzlies crowd the bottom of the list, with rookie Greivis Vasquez tied with Xavier Henry for top honors (see chart below). And now, the player with the shortest average separation between him and all other players, the guy closest to all other nodes, the Center of the NBA Universe: James "Buddha" Edwards, with Moses Malone right there with him. Edwards played 19 seasons for eight different teams in the middle of the NBA's history and thus built enough connections that he is now on average just 2.46 degrees from any other player. Likewise, Moses's pro career spanned 21 seasons, 19 of them in the NBA; he played on a Buffalo Braves team with Ernie DiGregorio and on a San Antonio Spurs team with David Robinson. If only the current NBA is considered, Eddie House is the hub, at 1.83 average degrees. There is also hope for Shaq, who is the current player with the shortest average link to the historical NBA. One day, he will most likely claim the Center of the NBA Universe title, in mathematical — if not gravitational — terms. Below is a chart showing the top five players in terms of average links for historical NBA and the current NBA. For the current NBA, any retired player wasn't included as a link. Average degree of separation is in parentheses. Play around with some of these connections yourself at our "Six Degrees" website, which was developed from the results of this project by my friend and fellow HSAC member Arjun Modi.